This was a really fun card to make. It really is one normal-sized card with one side shortened and one mini card put together overlapping each other. The little crab keeps the mini card closed. So cute! I chose this card so I could use Card Directions again! Such a cute little set and at $1.99 how can you pass it up? 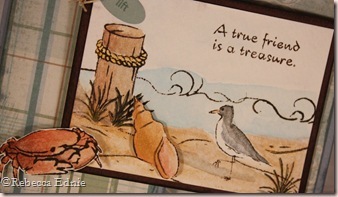 I used Shore Treasures to make the main part of the card. I LOVE this set!! The style of the illustrations are so perfect for watercolouring! Kinda wispy and flowing. Yeah, I know my watercolouring is far from perfect but I have such fun doing it and I wasn’t going for perfect. I think I should have stamped my waves at the edge of the sky and the water and a line of sand at the edge the sand and the water. Oh well. Unfortunately, the colours are somewhat washed out, even with no flash. ***SIGH*** You also can’t see the PearlEx I used for the shell and the sand. I took photos of the stages involved in opening this card above. Plus a close up of the watercolouring. I was actually quite pleased with the crab. I think he really looks like the sun is hitting his right side. I’m not sure I have ever seen a real crab so forgive me if the colours are wrong! Ink: Stazon brown, bordering blue-SU! Paper: DP-Bella Bella, bordering blue and chocolate CS-SU! 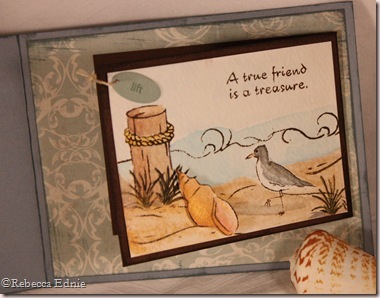 The beach scene you created with this set is perfect! What a gorgeous scene! Looks just beautiful! 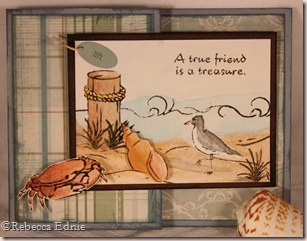 I love the fold and the crab that holds the card closed, so cute! this looks great! love the theme, the colors, the layout!